How Long Does Moss Phlox Bloom? How Far Apart to Plant Creeping Phlox? Creeping phlox looks elegant crawling over rocks and tumbling over walls in gardens. With a soft blanket of needle-shaped green and a vibrant show of small pink, white, red, or purple flowers in early spring, creeping phlox makes an easy and strikingly beautiful ground cover that just continues to spread as far as there's dirt to allow it. Sometimes pruning is needed to tame this perennial plant, however. Lift the green layer of your phlox plant. Creeping phlox grows in layers with the newest growth on the top. Underneath you will see that there is a layer of brown, dying old foliage. Trim the brown layer back dramatically with the garden shears or a pair of regular scissors if garden shears are not available. There may be a middle layer, depending on the age of your plants, of older but still green foliage. Feather in the middle layer by trimming it back but not cut as far back as the browned section. As this layer falls into place, it will hide the old, unsightly decayed section. Trim the new growth on top, allowing it to cover the middle section. Carefully cut each flower to shape the plant in a natural versus cutting off in a straight line. Prepare a sunny planting area for the creeping phlox. Work the soil with the garden spade down to a depth of approximately 12 inches. Work in at least 2 inches of compost to the top of the soil with a garden spade to improve the soil. Rake the soil surface smooth. Dig holes for the creeping phlox plants that are two times wider than the temporary container holding the phlox plants. Consult specific planting instructions accompanying your creeping phlox plants to ensure that you space the plants properly. Generally, space creeping phlox plants 10 to 12 inches apart; in a short time, they will grow together to fill in the spaces. Place the phlox plants into the prepared holes so that the tops of the root balls are at the same height as the surrounding soil. Fill in soil around the roots of the phlox plants and pat it down carefully. Water the plants generously. There are two species of phlox commonly grown in gardens today: P. stolonifera or creeping phlox and P. subulata or moss phlox, sometimes called moss pink or ground pink. These low-growing native American perennials are suitable for carpeting rock walls and banks with sheets of lavish spring color. Most phlox have flowers that bloom in loose clusters of four to ten blossoms. Creeping phlox is native to eastern woodlands. It spreads rapidly on stems that root wherever nodes touch the ground, forming broad mats of foliage. Creeping phlox grows to only 6 - 12 inches high and is commonly used as a ground cover. Its broad oval leaves, about 1 1/2 inches across, are covered with downy hairs and lie flat on the ground, forming a dense carpet. The flowers are an inch across and usually come in shades of blue or purple. Moss phlox stays green year-round in mild climates. It forms dense mats of foliage 6 inches high and is often used as a ground cover. Tiny needle-like leaves cover its stems, and it flowers profusely. The many varieties of moss phlox offer a wide choice of flowers with round, narrow, notched or starlike petals, in a range of colors that includes white, lilac, lavender, pink, rose, magenta and blue. In some varieties the flowers are slightly fragrant. Nurseries now offer many more phloxes, including some very showy hybrids. GROWING PHLOX Phlox is hardy in Zones 3-8. Creeping phlox grows best in shade or dappled sunlight in soil enriched with leaf mold, pH 5.5 to 7.0. Moss phlox, the easier species to grow, thrives in full sun in almost any well-drained soil. Phlox may be grown from seed, sown in spring or fall, or from nursery plants set out in the spring or autumn and spaced about 10 inches apart. To stimulate fresh growth and sometimes renew blooming, shear the foliage after flowering. Established clumps of creeping phlox and moss phlox may be divided in the spring after flowering. New plants may also be started from seed--both seed themselves freely, or they may be started from tip cuttings taken in summer to flower the following year. Creeping phlox ideally should transplanted in spring, as soon as the ground thaws but before the plant blooms. 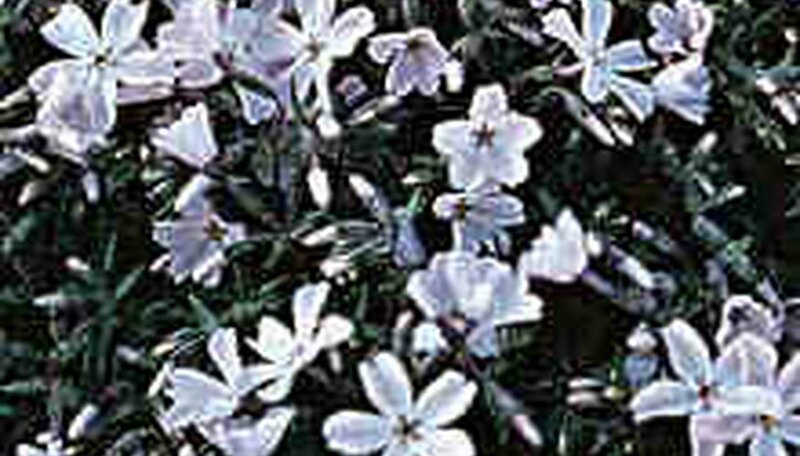 Creeping phlox, an early spring bloomer, also can be transplanted immediately after blooming. Moss phlox (also called creeping phlox) blooms for a two-week period in the spring. The blooming period ranges from March to May depending on the planting zone. This perennial evergreen ground cover prefers a sunny location for best blooming results. Creeping phlox, or Phlox subulata, should be planted 8 inches apart from each other. The plants grow 4 to 5 inches high with early springtime flowers. It is used as a ground cover, border plant and for rock gardens. Loosen soil by cutting through the thick mat of phlox. Keep the section you wish to transplant plug-sized--around a couple of inches in diameter. Phlox grows quickly by spreading its roots. Creeping phlox propagates best from non-woody stems. Prepare your transplant location by loosening the soil. Mix in humus or compost to improve the nutrient content. Creeping phlox propagates by spreading new roots and "creeping" its way in open soil. 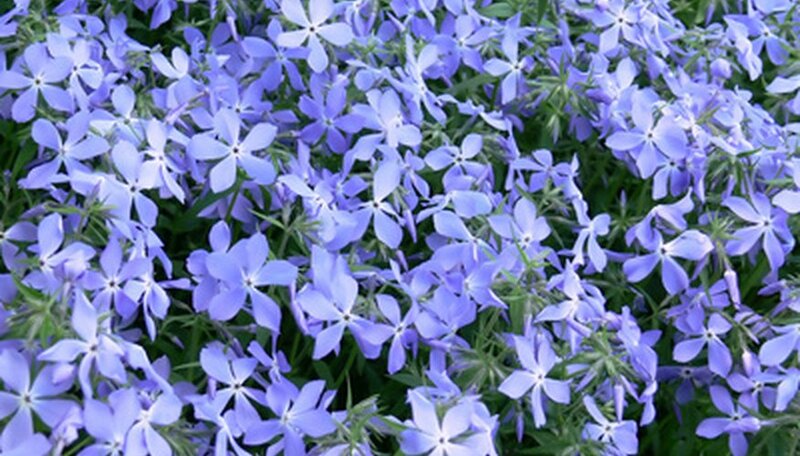 Pull your phlox plug, gently, lifting the roots out of most of the dirt. It's important to have bare root but some dirt is fine. Replant your plug by just covering the roots in the loose soil of the new area, and water immediately. Keep soil moist until plant starts to re-root itself.